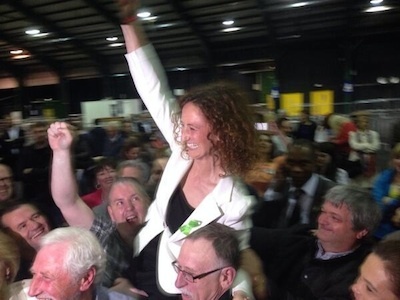 Sinn Fein’s Lynn Boylan became the first Irish MEP to be elected to the European Parliament in this election, topping the poll in the Dublin constituency by a very wide margin over her mainstream party rivals. Her election with 23.6% of first preference votes on Sunday night caps a radical departure in Irish politics, with Sinn Fein, left-wing parties and independents capturing almost two hundred local election seats at the expense of the conservative parties. Boylan scored more than 83,000 first preference votes on first count, just short of a full quota, and some 30,000 more votes than the next candidate, Fine Gael’s Brian Hayes, who as elected on the 7th count along with former Labour MEP turned independent, Nessa Childers. The tsunami of votes suggested Sinn Fein, if it had fielded another candidate, could have won two out of the three seats in the capital constituency. Earlier in the the day, there was another shock to the established order when the party was confirmed as by far the dominant force on Dublin City Council, electing 16 out of 63 councillors, twice the numbers of councillors as its rivals. A large crowd of Sinn Fein supporters cheered the announcements which took place in the RDS on Sunday night, and the jubilant scenes echoed and magnified the celebrations which have taken place over the weekend in other count centres. Despite achieving a relatively modest 15.3% of first preference votes, Sinn Fein is now set to almost triple its number of councillors in the 26 Counties to more than 160, and looks set to gain an MEP in all four Irish constituencies, north and south. On Saturday, the party was confirmed as the largest party in the North of Ireland by vote share, with 105 councillors there, and it is now by far the largest political party on the island of Ireland. Dramatic gains continued to accrue for Sinn Fein across the state on Sunday, securing the election of candidates in each of Galway’s three electoral areas and populating the midlands with councillors, in some areas winning one seat per ward. Ms Boylan said she hoped the government was listening to the anger that had been expressed by voters across Ireland in both the local and European elections. A member of the Sinn Fein Ard Comhairle and an active Sinn Fein member for eight years, she said she would stand up for Dubliners when she went to Brussels. “They’re fed up with people going over as ‘Yes’ men and women. I’m no ‘Yes’ woman,” she said. She described the support she received as “fantastic, absolutely overwhelming”. She said the people she spoke to were sick and tired of austerity being imposed by the Troika and by Europe, and that people wanted her to stand up for Ireland. “The electorate wanted someone to go to Europe and not go over saying yes to everything, they wanted someone to stand up for Ireland,” she said. Sinn Fein deputy leader Mary Lou McDonald described Ms Boylan as young energetic and committed. “You can run young candidates, women, and people will respond. They know the real thing when they see it and Lynn Boylan is the real thing,” Ms McDonald said. Tallies remain sketchy, but expectations are high that Sinn Fein’s Liadh Ni Riada will also be elected to Europe from the Ireland South constituency, while the party’s third candidate in the 26 Counties, Matt Carthy, should also take a seat in Midlands-North-West. Counting proper gets underway in these constituencies tomorrow morning. While progressives were basking in their achievements tonight, other opposition parties also found cause for celebration. Fianna Fail and the Greens were seen to have emerged from an electoral purdah following their role in the collapse of the 26 County economy and banking system when in coalition in 2008. Fianna Fail is now set to be the largest party in local government with some 250 seats, and ahead of the main government party Fine Gael; while former Green Party minister Eamon Ryan almost dramatically returned to politics with a European Parliament seat in Dublin. Taoiseach and Fine Gael leader Enda Kenny conceded there had been a major shift in Ireland’s political landscape. But it is the junior coalition partners Labour who bore the brunt of the backlash for years of punishing cutbacks, with candidates being ousted unceremoniously by voters. In Cork, all eight of the party’s councillors lost their seats. High profile casualties included the sitting Mayor of Dublin, Oisin Quinn, and the sitting Mayor of Cork, Catherine Clancy. Labour leader Eamon Gilmore will meet Kenny this (Monday) evening to try to formulate a response to the debacle. With unrest developing in the Labour Party over the party’s disastrous performance, there were suggestions that a cabinet reshuffle is planned. It is understood Gilmore is likely to leave the Department of Foreign Affairs, where his sycophantic approach to the British government and royalty ahead of 1916 centennial events generated considerable anger among voters. There is strong speculation that he will move from Foreign Affairs to Jobs and Enterprise, and that Fine Gael’s James Reilly will also lose his Health portfolio. As of 3am on Monday, the following was the state of the parties in terms of local election.